My name is Gareth Cowlin, and I have stammered since childhood. I’ve never really minded stammering – it was just one of those things, in the same way that I’ve always had hands and feet, it was always a part of me. Over the years I’ve even become quite good at concealing it. Early on, I got into the habit of ‘switching’ words out. For example, I generally have problems with words that begin with the letter D. Not all the time, but enough times to make me aware of it. A sentence like ‘Did you see Dad’s Army?’, is probably not even worth attempting. Therefore, if I needed to say, ‘Do you want to do such-and-such…’, I’d instead say, ‘Would you like…’ or ‘How about we…’ Nobody would really notice, but I do it all the time. Incidentally, this approach is absolutely not endorsed or recommended by stammering experts, as it avoids and suppresses the problem, which can sometimes cause long lasting mental health damage. (Spoiler alert: it absolutely did). There are times when speaking certain words is unavoidable, though. I used to work in a bookshop and there were several instances where I would ‘have’ to speak out a title. Most were okay, but you cannot replace a word in a book title (James and the Giant Avocado, Harry Potter and the Chamber of Owls and The Secret Blog of Adrian Mole). But a bookshop audience is fine, generally, and they were pretty accommodating to the odd muddle. It’s more problematic at social events though. You normally need to think a bit quicker there, when the conversation flows back and forth like ping-pong. Someone will say something, I’ll think of a response, work out if there will be a stumbling block, switch a word or two out and talk. This extra mental leap often means that I’m so out of sync with a group that I’m quickly left behind. And, don’t get me started on telling jokes. Jokes, by their very nature, are tightly scripted and paced. You can ad-lib a joke, but you run the risk of swapping out an important element and ruining it. Also, if the punchline revolves around a specific word that, halfway through the telling you realise that you can’t pronounce, then you’re in trouble. Over the years I’ve become quite socially anxious. 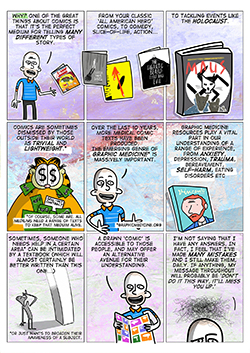 It’s funny, but I didn’t attribute my social anxiety and depression to my stammer. I just thought it was pretty rotten luck to hate talking to people AND have a stammer. It seems obvious now that I’d got the whole thing the wrong way around. I only realised this because, for a few years, I wasn’t feeling right, so I went to see my doctor. I divulged a long list of classic depression tropes and they suggested cognitive behavioural therapy (CBT), which helped. A while later, I visited a private therapist because I had a few residual questions lingering from the CBT sessions. During that session, I was asked about my stammer, which I brought up in passing. 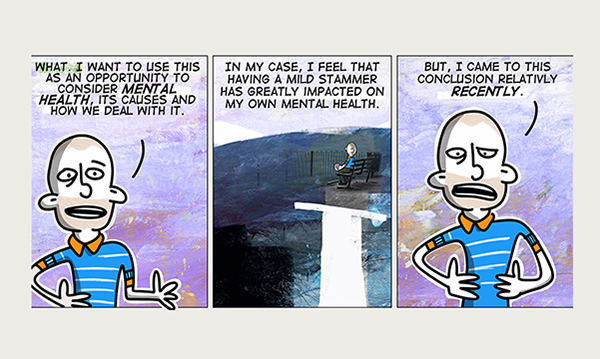 Anyway, the therapist suggested that the stammer is intrinsically linked to many of my current mental health issues. It was the cliché ‘lightbulb moment’. 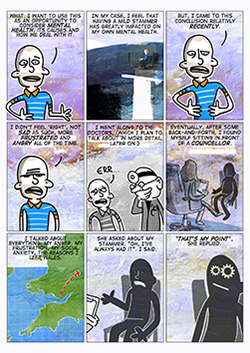 Outside of my day job, I draw comics and I think it would be interesting to develop a comic focusing on some of the reasons behind various mental health issues, starting with my own, stammering. It’s at an early stage, and I would like to align myself with a charity or publication that would benefit from this output.